Bala hits you in the face with his direct drama, palpable anger, searing melodrama and violence. The first time I saw one of Bala’s films, I Am God (2009) early this year at the International Film Festival Rotterdam, it reminded me of Sam Fuller at his prime: In your face drama and action that doesn’t shy away from the harshness of life and also is completely earnest in its attempt to sweep you off your feet with an entertaining story. Bala’s first movie Sethu (1999) is said to be the start of Tamil New Wave, that fresh wave of commercial yet socially engaged films by young filmmakers from Tamil Nadu, which we have written about previously here. Sadly, so far I have been unable to find Sethu in any way, shape or form. The film also launched the successful career of Vikram as a star, who returns in Bala’s third film Son of Ancestors (Pithamagan, 2003) as Chithan, an orphan who grows up in a cemetery with very little human contact. He grows up to be half man, half animal, mostly communicating in growls, and the only human concept he really understands is loyalty. He’s also very violent. Vikram and Suriya in Son of Ancestors. Chithan is the kind of unadjusted protagonist that we’d see more often in Bala’s work. There’s Rudra, the Aghori who has no time for the rules of regular society in I Am God and ends up beating those he perceives as villains. There’s the carefree simpleton Rasa in Vagabond (2013), whose destiny is fixed when he tries not to be an irresponsible lout anymore. Both are orphans from a young age, just like Chithan, although Rasa has been raised by his grandmother. And then there’s Sannasi in Tharai Thappatai (2016), who has a father who all but disowns him. He too ends up going on a violent rampage, like Rudra and Chithan, but this time around it feels unearned and unsatisfactory. As does Tharai Thappatai as a whole. Coupled with the subdued to negative reactions Bala’s latest, Naachiyaar (2018), seems to be getting (just released in India this year, I’ve not been able to see it yet), it appears Bala is currently in a creative rut or perhaps has even lost his touch. 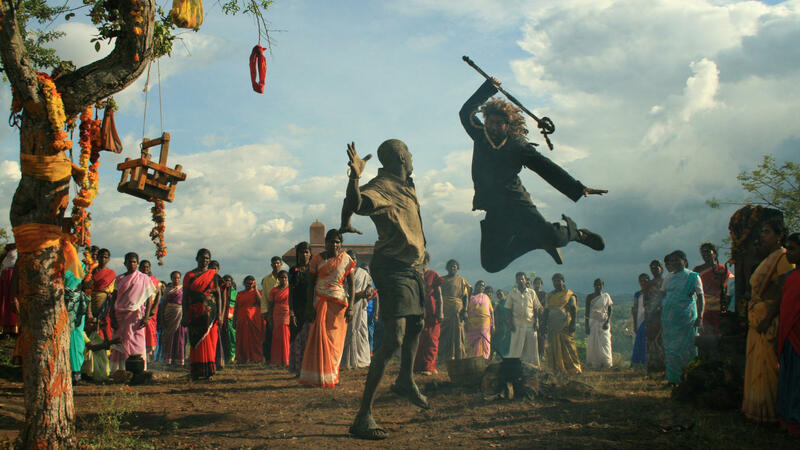 While Bala’s strongest films are great indictments of exploitation, Tharai Thappatai feels more like exploitation itself. That touch that ignites the screen and the heart in I Am God and Vagabond, and to a lesser extent in Son of Ancestors. The touch that contextualizes the violence perpetrated by the orphans as a last resort response to the exploitation of the downtrodden denizens of the lowest rungs of society by nasty, nasty men who make a living off of that exploitation. Gangsters who work with the police to keep the working class and the underclass down. In Son of Ancestors, Bala makes the plight of cemetery workers literal. Per tradition, they belong to the untouchables of Indian society, those below the caste system. Their isolation from the rest of society is made literal by Chithan being so removed from society’s norms and rules he can only interact with other people in extreme ways: either with utter devotion or with harsh violence. In I Am God, Bala turns his spotlight on disabled orphans and homeless people, who are forced to work for a gangster boss, who rounds them up and makes them work for him in return for food and a home in an abandoned underground temple. They are his slaves, more or less. Similarly, in Vagabond the trusting, naïve nineteenth-century Tamil workers that are cajoled in working on a British plantation in the north of the country are turned into slaves. Worked to the bone under harsh conditions and kept on the plantation by a complex lending system that ensures they have to stay indefinitely to work off a never-ending debt, they are robbed of their humanity and their future. In what I consider to be Bala’s masterpiece, he shows with searing melodrama the exploitation of India by the British Empire and thus the direct villainy of colonialism. In Bala’s hands, the promise of the plantation as economic boon becomes a kind of hell from which there is no escape. But not only is Vagabond a strong indictment of the exploitation and violence done upon the people of India in service of a western economy, Bala’s film also works as a strong allegory for the current day exploitation of the Indian working and underclasses in service of western economies, without ever having to say as such. Arya in I Am God (2009). By the end of I Am God, after two hours of seeing disabled people being forced to beg in the streets as part of an organized gang’s moneymaking scheme, the deadly beating the villains get by Rudra, believing himself an incarnation of Shiva, feels like a very welcome righteous wrath. Son of Ancestors ends similarly, but here the destruction of the drug dealer by Chithan doesn’t feel as satisfactory since Chithan’s own behaviour is partly responsible for the innocent death he is avenging. It doesn’t offer the same furious, divine release as I Am God. After these two films, I especially longed for such release while watching Vagabond, but here Bala subverts the expectations his own previous films have created and gives no such release. After Vagabond ends, Bala still holds us as much in the vice grip of his dramatic story, as the British did the Indian protagonists of the film. Here’s hoping that this Bala will return one day to give us more films like Vagabond and I Am God.